The purpose of Yin Yoga is to pause, soften and connect. Allowing yourself to notice whatever is arising within you, without judgement as you connect to your breath. The Deer, as far as I know, is a pose exclusive to the practice of Yin Yoga. It is a wonderful pose when performed just for itself, and yet is also an alternative to the Pigeon Pose, or the Sleeping Swan which is the yin version. For those whose hips have difficulty externally rotating to do the full Pigeon Pose, this a great modification. Even if you despise the Pigeon Pose, which a lot of folks do, you can get the same therapeutic benefits of opening your hips and your second chakra energy with the Deer Pose. 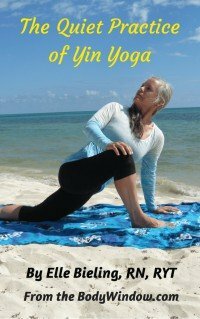 The purpose of the Yin Yoga practice is to bring to your consciousness, pure awareness and pure connection to your body. This is difficult to do when you are focusing on a perfect form, as you race from pose to pose in most yoga routines. Yin Yoga is the practice of embodying your emotions through giving them full expression through the practice of opening your body. A healthy person learns to fully "see" and experience all of their internal and emotional states by practicing yin yoga. This is done through the mindful observation of the body and emotions in the absence of judgement. To learn even more about what is Yin Yoga, please read about this mindfulness practice, by clicking here! You will never regret it. To begin the Deer Pose, sit in the Butterfly position, or the Bound Angle Pose, as it is called in the yang practice. Now take your left leg and swing it around behind you, while keeping it in the bent position. You should now be sitting as shown in the second picture, below, with both legs in 90 degrees. Your front, right shin should be as parallel to the front of your mat as possible. The tendency in this pose is to lean into your right hip. If you do this, the left hip will pop off the ground. Make a conscious effort to draw your left hip down and ground it as much as your are able, without being forceful. Most people just don't really get this pose! It is NOT an easy pose, and requires strong attention to the hips to get it right. I like to keep the palms of my hands on my knees as shown, as a gentle reminder to keep both hips grounded. At this juncture, you can go into the full reclining pose as shown farther down, OR you can continue to do a yang-like upright pose by adding the twist as shown immediately below. I love to add energetic, and more muscular-engaging poses like the Deer Twist, just prior to the full yin release of the Reclining Deer Pose. This yin-yang yoga combination is very therapeutic. As in life, the yin and the yang must be balanced. If you chose the Deer Twist for your own personal yoga practice, hold it for 3-5 minutes if you can. Notice what happens in the twist, as you release farther into each exhale. Just a little more squeezing and wringing out happens, doesn't it? The twists nourish your midsection and aid the digestive process by opening and balancing your third chakra energy center. Unwind from the twist and go back to the upright pose. Now you will assess your body as you start to lower your torso, directly over your right knee. Make sure that you are centered over the knee as you lower your body, first onto your elbows to assess any potential for pain and discomfort. If you feel a mild edge, stay here. Perhaps drape your body over a yoga bolster or a cushion, to aid your release into the pose. Make sure you can hold this release for 3-5 minutes without fidgeting. Practicing mindfulness in Yin Yoga requires that you stay present and fully aware of your process. This cannot be done by fidgeting around! If you have not reached your edge in the Reclining Deer, on the elbows, go ahead, if it feels safe, and lower your torso all the way to the ground, with your chest resting on your right knee. You may chose your own arm position. If your shoulders are tight, you do not have to extend them overhead. I like to place my hands in the prayer position, in order to keep the pose more devotional. If you have very open hips and still do not feel an edge in this full reclining pose, then go back to the Pigeon or Sleeping Swan pose. Hold this reclining pose for 3-5 minutes, or even more if your heart desires! When you finish on one side, don't forget to repeat the pose on the opposite side. The counter pose to this forward fold is any back bend. In fact, I like to slowly arise from the folding, pushing up with my hands until my torso is upright, once again. Then, before moving out of the pose with my legs, I arch my back into a nice back bend, roll my head back and hold this back bend for 5 breaths or so. Then, I slowly bring my torso back to neural and unwind my legs. While you are practicing and holding the pose, also add any internal method of breathing for even more therapeutic and meditative benefits. These include belly breathing and ujjayi breathing (sometimes called "ocean" breathing). Whatever breath you choose, stay conscious of it, whenever your mind wanders. This truly is a meditation practice. In all yogic practices, one should remain conscious of their breath! Also remember that you are performing a self-acupressure on your body, as you tug on the tissues that stimulate your energy centers. The Deer Pose especially is beneficial to your 2nd Chakra, and if you add the twist, the 3rd Chakra as well. If all of the energy and meditative work seems over your head, yet you want to learn more about how it may be healing for your own life, please consider my personal holistic health coaching service to assist you! May you open your energy and emotional centers for healing as you perform the meditative practice of Yin Yoga's Deer Pose! May you successfully reconnect your body, mind and soul!